Adventurous married couple Dana (Fiona Dourif - Curse of Chucky) and Charles (Kevin Ryan, - TV's Copper, Guilt) plan a trip into the wilderness before settling down to family life. However on the first night they hear fellow campers being viciously attacked by a mysterious beast not far from their tent. Unable to escape, but desperate to help, they pull to safety an injured stranger who tells them about a creature that stalks and haunts the woods causing the disappearance of hikers and hunters. For an unknown reason the beast that lurks in the trees will not attack the couple's tent so they are trapped inside the claustrophobic prison until their escape. Cabin fever though soon sets in and the couple and the stranger become desperate for freedom. The question however is; how much will they sacrifice to get it? 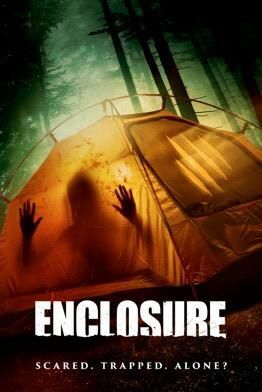 From Director Patrick Rea (Nailbiter), Enclosure will be available to watch on Digital Download from 8th May 2017.